First of all, Happy Fourth of July!! And thank you so much to our military men and women, plus their families!! Every once in a while I like to do something nice for the guys and girls on Chris' team at work, and that pretty much always involves baking. Since Bradley is on a banana fix, we always have an abundance of them on hand. 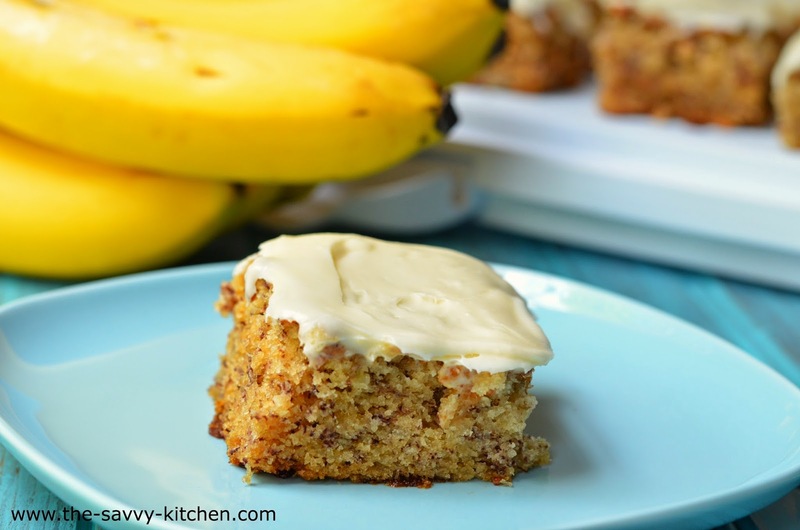 So it's no surprise that when I decided to make something last minute and noticed 20 ripe bananas in our fruit bowl, I knew bananas were going to be the base of the dish. 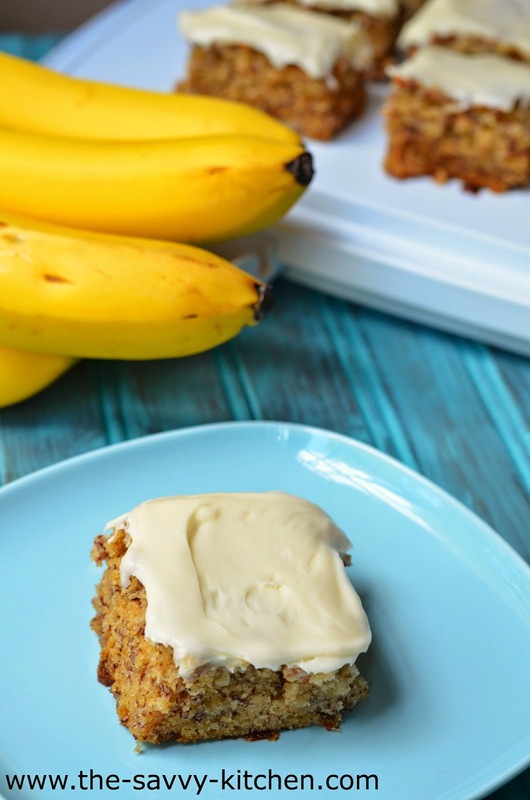 These bars are basically a super moist banana bread topped with a rich and decadent cream cheese frosting. In my opinion, cream cheese frosting makes anything taste better. This bread didn't need any help in the taste department, but the frosting just made them even better. Instead of using all eggs in the batter, I decided to use a mixture of eggs, oil and applesauce. I think that definitely contributed to making the bread so moist. Plus it made them a little bit healthier, too. Enjoy! In a large mixing bowl, beat the butter and sugar together. Beat in the egg, oil, applesauce, bananas and vanilla. In a separate bowl, combine the flour, baking soda and salt. Slowly add to the banana mixture. Mix until combined. Pour into the prepared baking sheet and bake for 30 minutes or until a toothpick inserted comes out clean. Allow to cool. Meanwhile, beat the cream cheese, butter and vanilla together. Add in the powdered sugar, 1/2 cup at a time, until fully incorporated. 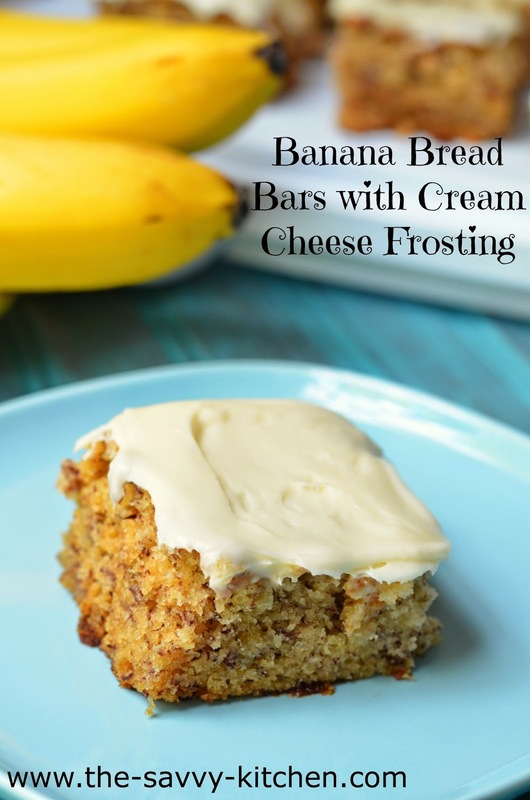 Once the bars are fully cooled, spread the cream cheese frosting over the top. Cut into bars. Store in the refrigerator.